Art and science have been constants in our lives, always piquing our curiosity and reinforcing wonder about, well, just about everything. But we’ve always thought that art and science are better together. It’s hard to articulate something we feel so passionate about. Thankfully, masters of both science and art, Matteo Farinella and Nadja Oertelt just happen to be great storytellers too, and guess what? They said yes to our interview request. Before we dig into the interview, we have a confession to make: we research just about everything. Thanks to libraries and the internet we can learn so much more than just the coursework from a class or the book we're were reading; we dig into the stories of the author who wrote the book, or the scientist who created the study, or the artist who made the work. 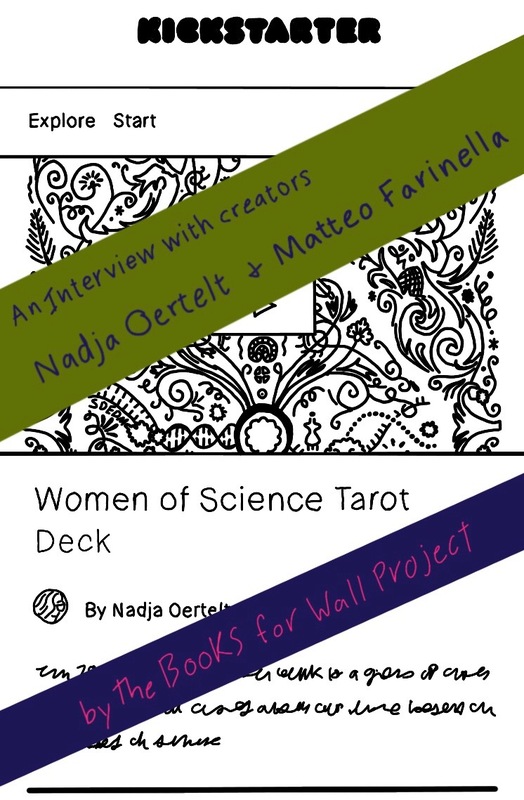 We discovered Nadja and Matteo's Kickstarter Women of Science Tarot Deck while exploring the EdX Series Program “Fundamentals of Neuroscience”, well, not the program itself, one of the program's creators Nadja Oertelt. 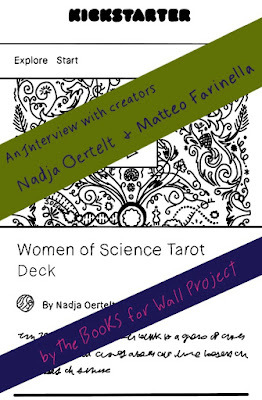 And so, when we found Nadja (co-founder of Massive), we dug into her twitter feed which led us to Women of Science Tarot Deck. And there we found Matteo and then found his website, which we couldn't help but wander through, and honestly, get lost in. Learning about the project made us even more curious, we wanted to know more about what was behind Nadja and Matteo’s vision. For us, curiosity leads to questions, and we had to reach out to the creative duo with our questions. And their answers proved that they are even cooler than we first thought. BOOKS FOR WALLS PROJECT: So, we’d love to know where you got the idea for a science-themed tarot deck? NADJA OERTELT: Some years ago a good friend started using a feminist tarot deck called Motherpeace as a framework for her own meditation practice. She used it as a way to begin telling stories to herself about why she felt certain ways or had certain reactions to people and her environment. She used the deck to do a tarot reading for me and I was hooked on how a card game like tarot could create a space between people (even strangers) to talk about very difficult, emotional or conceptual topics. I don't think of tarot as 'fortune telling' or 'magic' but rather as a conversational aid, a kind of connective tissue for storytelling. I started reading a lot about the history of tarot (the filmmaker Alejandro Jodorowsky has some wild and crazy thoughts on tarot, and remade a historical deck and wrote a book on tarot) and thought it was a fascinating game that sat at the intersection of psychology and history. I also love translating science using metaphor and story (I've spent the last ten years working with illustrators and artists like Matteo to decipher and translate scientific complexity into narrative). So when Matteo and I started the Our Heroes series, I thought it would be great to eventually turn the illustrations into tarot cards. We could examine the social and emotional impact of womens' scientific discoveries and the cultural impact of paradigm shifts in science and engineering through the tarot storytelling framework. MATTEO FARINELLA: I have to give Nadja full credit for that. I didn't know much about tarot, I mostly associated it with magic and divination. At the beginning I was kind of skeptic about the idea, but once I learnt about the complex history and symbolism of the tarot, I became very excited about making a science-themed deck. I like the idea of using an old tradition to explore modern concepts like science. BFWP: Can you share a bit about why you think it is important to share the history and stories of women scientists? NADJA: In a 2018 poll 81% of Americans could not name a single scientist. Of the 19% who could, 27% named Stephen Hawking and 19% named Neil deGrasse Tyson. Jane Goodall was named by only 2% of this group and was the only woman mentioned by name by any significant number of those polled. The fact that women who have made significant contributions to science are not public figures is a huge shame and a sign that we've failed in educating students and the public about the contributions of anyone to science other than white men. MATTEO: If you asked me 2 years ago if I though women played an important role in the history of science I would have answered "of course" but then, when it came down to it, I probably couldn't name more than 4-5 of them. One thing is to agree or understand something in theory and quite another is to actually know it. Learning their names, their faces and their achievements had a really powerful effect on me. This is not just about 'inspiring younger generations' but also re-educating ourselves, because the way we tell our history affects our present and future as well. BFWP: When art and science come together, amazing things happen. In what ways do you see combinations of art and science reaching out and connecting with people in our current culture? NADJA: Artists tell stories to help us understand ourselves and the world around us, and to a certain extent the role of scientists and engineers is to create the world we collectively imagine for ourselves through the hazy window of artistic and humanistic endeavor. There is a lot of beauty in the translation of scientific curiosity and knowledge into the metaphors of art. One of my favorite books of all time is Jacob Bronowski's Origins of Knowledge and Imagination (LibraryBorrow/IndieBuy), which is a beautiful meandering series of lectures on humans' need to understand the universe through the tools of art and science. MATTEO: I could give many (and long) answers to this question, but for this particular project, I think art is a way to give science a more human dimension. As much as I love science I can see how sometimes it may feel distant and detached from our everyday lives. A deck of illustrated cards is a way to carry these stories with us, to look at them over and over, a chance to contemplate scientific achievements (without the pressure of learning) and chat about them with our friends at a party. BFWP: If you could give the younger generations one skill to help the future, what would it be? NADJA: I think they don't need anything from me or our generation: they have the capacity to do what we could only dream of! If anything, I would give them the skill to see our failures clearly so as not to repeat them. The huge environmental problems that have been created for the next generation are unfathomable. The skills we now need and that younger generations need to survive and thrive will be that of radical political action, collaboration, openness and compromise. MATTEO: That's a difficult one... maybe the skill of acknowledging our own biases and mistakes? I'm afraid we will always get things wrong, the only thing we can do is to have the humbleness to recognize this and make amendments before it's too late. BFWP: We think this paragraph from your Kickstarter page is amazing: “We can't predict the future, but we believe that learning about science and telling the stories of inspiring women in STEM can help us imagine a better world and explore radical new futures, rooted in scientific ideas.” Can you comment and/or elaborate on this thought? NADJA: I think Matteo answered this perfectly! MATTEO: I really insisted on having that line. I wanted to make clear that our goal here was not to give easy answers. Quite the opposite: I want people to feel empowered to think for themselves. Do not trust those who tell you the future is already written, that there is only one path to follow. Like these pioneering women, who followed their curiosity despite what everyone else told them. In our experience, curiosity leads to questions and questions often lead to stories. And a really good story makes us ask even more questions. After the interview, we have even more questions for Nadja and Matteo and we are really looking forward to where the questions might lead. we cannot wait to continue our conversation! We are continuing this story on CognEYEzant (Nadia's 365 day art project). Stay up to date and follow on the website or on Instagram.